After winning this match last year with Scott Jackson I was looking forward to defending our title but when I messaged him to see if he wanted to fish, he couldn’t make it due to a family commitment so I then contacted my other regular partner, Justin Charles, who couldn’t make it either! I was starting to think I perhaps ought to change my deodorant but then Hurf agreed to fish with me – cheers mate! The next problem I had was that with nine pairs booked in, where was I going to put them all? I would have loved to put them all on the Isle as Barney loved the river but to find eighteen decent pegs at the moment is a big ask, I did ask several people what they thought and they all came back with different suggestions! With four pegs dominating at Isle Brewers (120, 125, 126 and 128), what else could I use that would compete with them, Hambridge was out of the equation due to horses being in the field and after the last match Redbridge didn’t appeal. After walking the river on Saturday with Frank, we decided on putting a section on the pond which would be hard but fair and then use Isle Brewers and 14, 15 and 17 at Coxes which had a nice colour to it and had done well the last time we used them although trout would undoubtedly be a pain. I got to the bowling club nice and early Sunday morning and it was great to see John and David Simms from Stoke-sub-Hamdon AA fishing today and we’re hoping to have some inter-club matches later in the year. I love the idea of forging links with other clubs like Taunton and Stoke and if we could get some others on board as well, we could have some great matches and get to fish some different venues, it might not happen but exciting possibilities, watch this space! 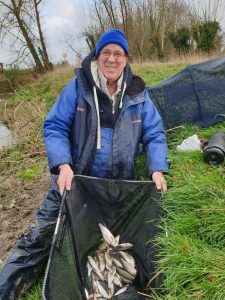 Barney’s Pairs is always well attended and along with the regulars it was brilliant to see Paul Adams fishing today as well as Rich Studley, Andy Welch and Tony Newman who always fish the open matches. After everyone had eaten and all the pools were collected, I announced the draw and asked one person from each pair to come up and draw and they could then choose who went where. First up was the river and as people started pulling their pegs out, there were the usual moans and groans or wry smiles when people owned up to being on a noted peg. 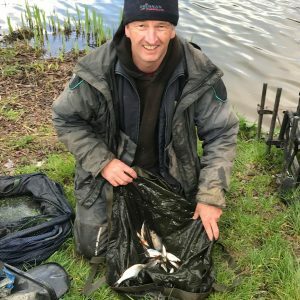 A very hungover Jake was happy with peg 14, Adie wasn’t as impressed with 17 and Paul was on 15, Terry ‘The Toast’ once again proved he ought to get his drawing arm insured for a lot of money when he revealed he was on 126 (Barney’s Bend), David Simms was on 128 and Tony also drew well with the weir pool at Isle Brewers. Nobody was admitting to Terry’s straight (aka peg 125), Rob had the choice of 123 or 127, Digger could go on 124 or 124a and that just left Hurf who confirmed we had it! Then it was the turn of the pond and on my wish list of pegs were 14, 13, 4 and 18, in that order and I was delighted when Hurf handed me peg 4 (can you draw for me every week please?). Fieldy was on 2 with Baz on 6, Rich on 8, John on 9, Andy on 13, Dave P on 14, Leighton on 18 and Frank on 19. There were several pairs with both anglers on really good pegs and to be honest, me and Hurf couldn’t wish for a better draw. John and David came in one vehicle and weren’t sure where they were going so Hurf said he’d go out the pond with them to drop John off and then David could follow him to the river so huge thanks for that, really appreciated. We got out the pond and the wind wasn’t too bad yet but it was due to let us have it around dinnertime! I got to my peg and the wind was blowing down into the bottom bank so hopefully I’d be relatively sheltered today. 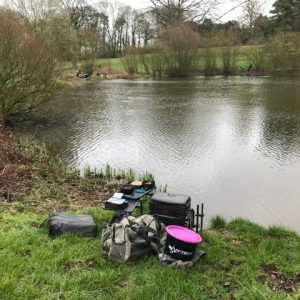 I set up three rigs, a 0.5 gram Drennan Roach for 11.5 metres straight out, a 0.4 gram Drennan Pencil to fish by the bush on the left at 13 metres (not used) and a little Preston Chianti to fish shallow (not used). On the side tray I had a pint and a half of casters, half a pint of red and bronze maggots, worms, Bait-Tech Super Seed Hemp plus some Pro Nat Bream Dark and Fine Lake Dark I’d mixed up the night before. I shouted the all in at 10:30 and cupped in three balls of groundbait at 11.5 metres before putting some chopped worm and caster in by the bush. I started over the groundbait with a single red maggot on the hook and was hoping it might be a little better than the last time I was on this peg when I had to wait 45 minutes for my first bite. After an hour, I hadn’t had an indication and as far as I could tell, nobody had caught yet, this was going to be rock hard and to make matters worse the wind had moved around and was now blowing from right to left and strengthening all the time. I could hardly hold the pole at times, presentation was non-existent and I felt sorry for Baz, Rich and John who now had it straight in their faces! A further half an hour ticked by and I was starting to think a blank was on the cards when I saw Baz, who was fishing the waggler, swing in a little sliver of silver and he let out a little whoop that he’d got off the mark, I also saw Andy down on peg 13 catch a small fish, so there were fish about. 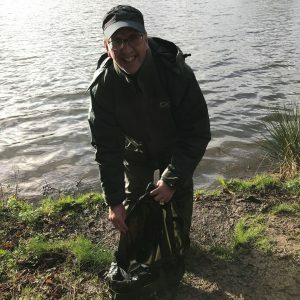 Then finally after an hour and three quarters, a positive bite saw some yellow hydro come out, I shipped back carefully and netted a nice 3oz roach – phew! Next put in, the rig settled and the float went straight under, only a tiny roach this time but I thought they’d finally arrived and I’d start to get a few now, especially as Baz had a couple more little fish on the waggler. I shipped back and the float just sat there! The wind was getting worse and worse, I was having to drop the pole on the water at times and I was just hoping to avoid any breakages. Baz’s hat kept getting blown off his head and judging by all the swear words coming from his direction, I don’t think he was enjoying it very much! After one particularly strong gust of wind that threatened to blow the pole into the bush on my left, I dropped the pole and when I lifted it up again, my rig was snagged on something and I lost a hooklength. 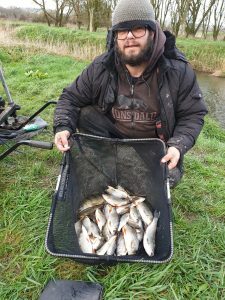 The wind had also blown my other top kits all over the place so I got off my box to retrieve them and also quickly popped up to see how Fieldy was doing and he said he had four little fish and that he’d seen Frank over on peg 19, net a decent skimmer. Back on my box, I checked my phone and saw Hurf had tried calling, I rang him back and he said the wind was horrendous as he was quite high off the water and pretty exposed, he’d caught a couple a chub early on and was getting odd roach but the wind was so bad it was almost impossible to actually fish. He also said he’d spoken to Jake in peg 14 and he was struggling. I put on another hooklength, this time a size 20 Gama Black to 0.08mm and went back out, the float sailed away first put in and I had roach number three. It was then a bite a chuck from small roach, had they just arrived or had dropping from 0.10mm to 0.08mm made all the difference? Just to add to the enjoyment,it started to rain quite hard and with the wind now reaching biblical proportions, these were some of the worst conditions I’ve ever fished in! 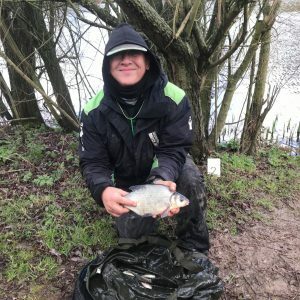 Dave P down on peg 14 had started off with his brolly up but had very wisely taken it down before it got blown inside out but even with it down and on the bank behind him, the wind caught it and blew it up the bank and then another gust took it and it nearly went in the pond – crazy weather! I was still getting a bite most chucks from small roach but a lot were coming off as I shipped back, I could barely see out of my specs because of the rain and the wind kept blowing my pole roller over, at one stage, it blew over on top of my pole and that was enough of that so I got off my box again and packed the roller away. 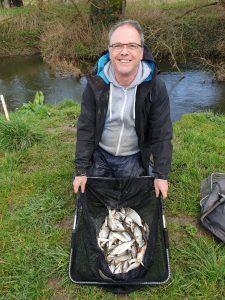 It was so frustrating because there were obviously a few fish there but it was impossible to achieve decent presentation, from what I could see nobody was catching much, apart from Baz who was still getting some small roach and Frank who I’d seen net another skimmer. With the wind and the rain, it was a horrible day and no fun at all, my bites slowed up and I didn’t really know what to do next, fishing 13 metres by the bush was out of the question so I just stuck at on the 11.5 metre line putting the odd fish in the net. In hindsight (that wonderful word again! ), I should have started a new shorter line where I might have been able to present the bait half sensibly. I did net another 3oz roach and had a chunky little perch around the same size. Hurf rang again with about an hour to go and said he couldn’t really fish now as the wind was ridiculous and had blown his keepnet (and the fish in it) out of the water several times so he was going to chuck a lead out with a lobby on the hook. As we neared the end of the match, I saw Frank net another skimmer and Leighton landed a good fish too, typically with about ten minutes to go, the wind died down a bit, the rain stopped and I had three fish in three chucks to finish with 28 fish (all roach apart from 2 perch) for probably a pound and a half or so. I packed up and as I walked past Fieldy he said he’d only had five fish. 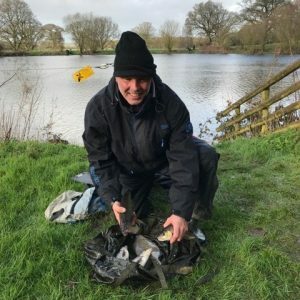 I got the scales from the car and started the weigh in with Frank on peg 19, he had four skimmers and a small chub for 6lb 1oz although he said he’d pulled out of one, I thought he’d win the lake with that but then Leighton had a decent bream and three skimmers for 8lb 5oz from peg 18 and I’d only seen him catch one fish! 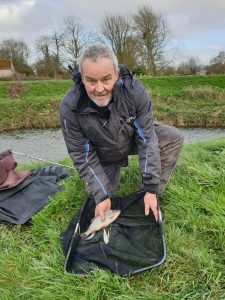 Dave P was next and had 1lb 2oz of small fish and was soaked as he didn’t have any waterproof trousers!, Andy W had 1lb 3oz next door and said he’d caught well early on until the wind got too bad. 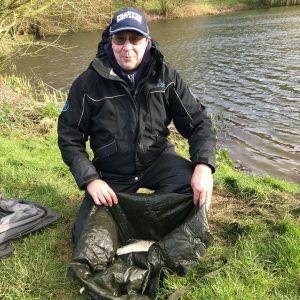 John had blanked on peg 9 and was gutted because he’d spoken to David who’d bagged up on peg 128 on the river. Rich S had a skimmer (which I hadn’t seen either!) and a few bits for 1lb 8oz from peg 8 and then Baz just pipped him with loads of small fish on the waggler for 1lb 9oz from peg 6. 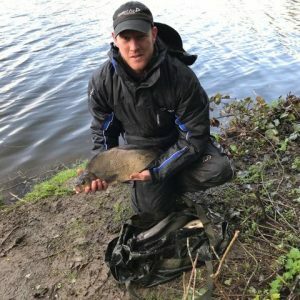 We got to peg and I knew this was going to be incredibly close, I tipped my fish into the weigh sling and Fieldy called it at 1lb 10oz which put me third in the section with just Graham to go, as we walked to his peg he admitted he’d had a skimmer on the feeder to add to the four smaller fish from earlier. 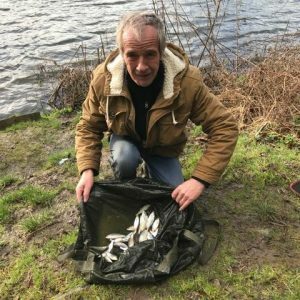 He pulled his fish out and the needle settled on 1lb 8oz so it had been really tight with just 2oz separating four anglers. Rob did well from peg 127 to weigh 2lb 14oz and then Paul Adams had 2lb 10oz from peg 15, Digger had 1lb 8oz from 124, Adie 1lb 3oz from 17 and Jake had 14oz from 14 so Upper Coxes had been really disappointing. I started working out the points and there was a tie with three pairs on six points so it would come down to weight and even then it was really close (points scores in brackets), Leighton (1) and Rob (5) had a combined total weight of 11lb 3oz to just edge it over Terry (2) and Baz (4) with 10lb 11oz, Hurf (3) and myself (3) finished third with 7lb 6oz and we picked up £27 each. The two section winners were David Simms and Frank Woodard. We always donate the peg fees from this match to charity and this year we decided to let the winners choose where the money should go and Rob and Leighton decided on Cancer Research, a brilliant cause. As it’s the last Sunday of the season next week, we’re looking to have a little knock up on the river somewhere, get in touch if you fancy it. Sunday 24th March, Bridgwater and Taunton canal open pairs match. Boat and Anchor and Smithies sections. 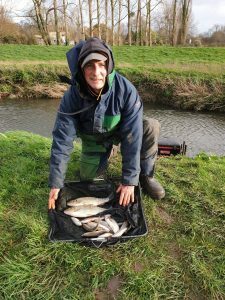 Names to Somerset Angling, tel – 01278 431777. £20 per pair. Draw 9.00am fish 11.00am to 4.00pm at Boat and Anchor Inn, Breakfast available from 8.00 am. 20 pairs already booked in.